Early and rare date Barber half dollar value is rising. Discover any of these or a higher condition coin in your group and the value often reaches into the hundreds of dollars. For the remainder, the starting value for a coin in "Good" condition is $8.91 . This minimum value is tied to the silver value of your coin. Find a higher condition old half dollar and they are on a level all their own. The "Uncirculated" Barber Half dollar pictured is an example of a highly desirable coin. Easily worth over $340 and passionately sought by collectors. Rare dates, rare mintmarks and Condition all combine to affect Barber half dollar value. How to "Grade" the condition of your coins is covered in detail below. From one Barber half to the next, quality is often the driving force behind price. Take your time, determine the condition of your coins carefully. See if any reach these higher values. The above are the wholesale Barber half dollar value. Computed from dealer's price lists with various mark-up factors figured in. They reflect closely the value you would expect to receive when selling. Searching through your coins for rare dates and rare mintmarks occasionally yields results. However, don't over look the impact "condition" has on your Barber half dollar value. Collectors and dealers first evaluate the state of preservation of a coin, assign a "Grade" and then use this to help determine value. Compare your Barber Halves to the grading image below. On the obverse look closely at the headband. All the letters to LIBERTY showing separates a coin in "Fine" condition from a coin in the lower "Good" grade. Hopefully at least one or two of your coins are crisp and sharp in all details reaching to "Extremely Fine" or better condition. A peek at the Barber half dollar value chart shows coins in superior condition are superior in worth. Small differences in improved detail lead to the higher grades. 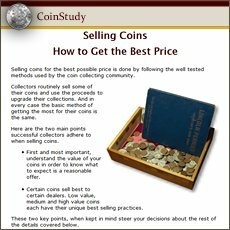 If your coin is valued over $100 and you are not sure of condition, there is help. In depth video Grading Barber Half Dollars | Video details a step by step process to judge condition and assign a grade. Dealer and rare coin auction sites often describe in their listings the traits making the coins desirable. Including the PCGS or NGC assigned grade. Additionally, these coin dealer professionals are potential buyers of your coins. Finding Higher Half Dollar Value - Mintmarks! Find the "S" mintmark on your 1897 and the value rises from the minimum silver value to over $73. Numerous other examples occur with branch mint coins often having higher values. To locate the "S" indicating the San Francisco mint, look on the reverse just below the eagle. The New Orleans mint placed an "O" and the Denver mint a "D" in the same location. 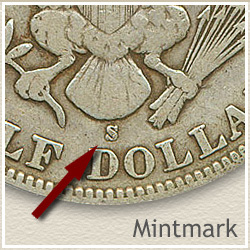 Philadelphia, the forth mint producing Barber Halves did not use a mintmark. Consider your group of coins as the beginning of a coin collection. 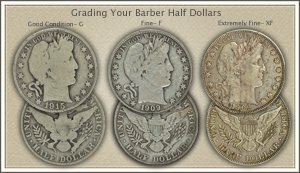 Discover your Barber half dollar value and begin an enjoyable and rewarding hobby. If that is not for you, one successful approach is to sell all your coins and use the proceeds to buy one nice rare coin. The one you were hoping to find in the box. Pass the thrill of a rare coin on to your children. 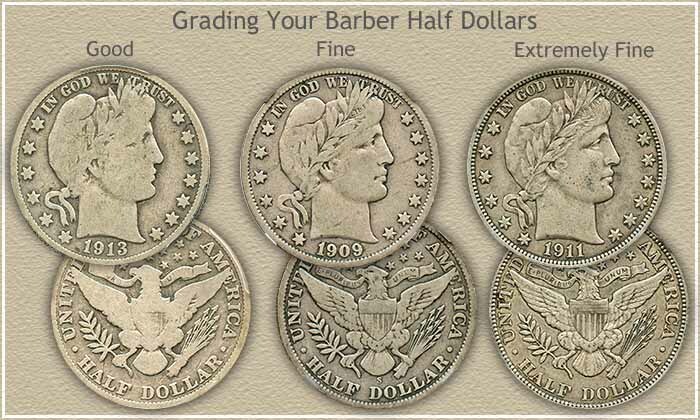 Many outside factors contribute to your Barber Half dollar value. Popular year after year, seasoned collectors improving their holdings, new collectors arriving, all leads to higher values. Your old coins continue to gain in value. Check back here to stay current. Collectors place great importance to the condition and grade of a Barber half. Grade is key in determining value of these coins. How to video followed by detailed descriptions of the elements to grade are covered. 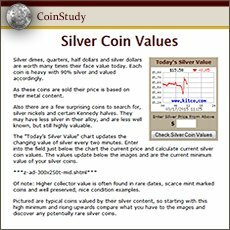 Print the Coin Values Worksheet - link in navigation column - to list your Barber half dollars and record their values. Should you decide to sell... use the worksheet as an invoice and packing slip when sending coins through the mail to dealers. It indicates you have done your coin values homework.